The Miniature Schnauzer is an alert, handsomely bearded little dog that ranks among the top 20 most popular breeds in the USA. Bred as a tenacious ratter, this German export is now cherished as a faithful watchdog and friendly, easygoing family pet – not to mention a well-preened show dog and agility champ. The Miniature Schnauzer is classed as a terrier in the USA, but it’s a unique member of that fraternity: the only one not to claim any British heritage. Its direct ancestor is the bigger Standard Schnauzer, a working dog known in Germany since the 1400s. According to the American Kennel Club, farmers likely crossbred Standard Schnauzers with Affenpinschers and Poodles while selecting for the small size of the Miniature Schnauzer: petite dimensions that, in combination with an athletic build and brave gusto, made the little beast an ace farmland ratter. Refined as a recognizable terrier by the late 19th century, the Miniature Schnauzer made it to America in the 1920s; the American Kennel Club registered its first in 1926, and the American Miniature Schnauzer Club formed six years later. The breed grew rapidly in popularity in the 20th century, its profile boosted (as the AKC notes) by such celebrity Mini-owners as Bob and Elizabeth Dole, Bruce Lee, and Mary Tyler Moore. The Miniature Schnauzer’s name is an apt description for the dog. “Miniature” reflects a rat-dog standing a foot or a little more high at the shoulder and weighing between 11 and 20 pounds. And “Schnauzer” comes from the German word Schnauze, or “snout,” which refers to the Schnauzer group’s distinguished muzzle with its mustache and beard. That furry schnauze as well as the impressive eyebrows are among the signature components of the Miniature Schnauzer’s look. The breed’s profile is proud and sharp-angled, the undercarriage rising from the deep chest to the hind legs and the top line subtly falling from the withers to the rump. The overall appearance is a very sturdy and muscular dog that stands poised for action. 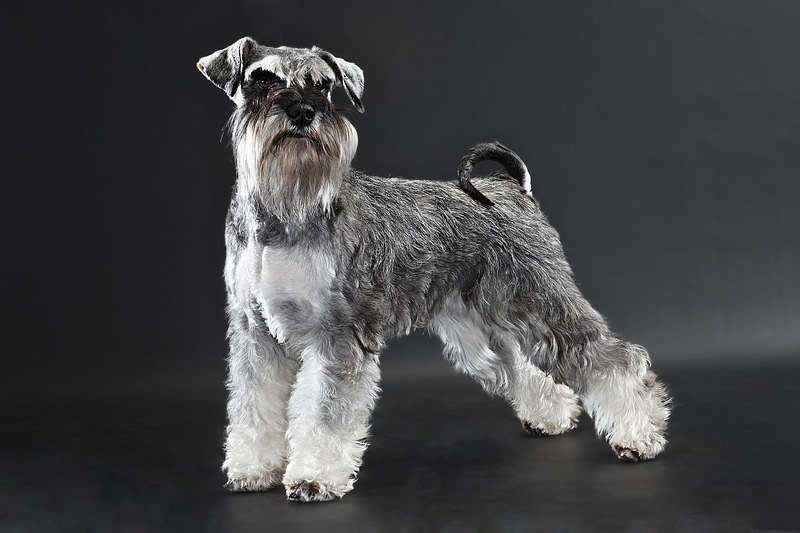 The Miniature Schnauzer’s double coat includes a coarse and wiry topcoat and a dense, soft undercoat. The formally accepted colors are salt-and-pepper, black-and-silver, and pure black. White Minis are often seen, but not recognized by, for example, the AMC or the American Miniature Schnauzer Club, which notes that the parent breed, the Standard Schnauzer, never shows a white coat, and that the color in Minis likely derives from modern admixture with other breeds. Included as it is among the terrier group, the Miniature Schnauzer exhibits fairly distinct behavior compared to the other terriers that share British heritage. Minis tend to be a bit more easygoing, a little less feisty, which doesn’t mean they aren’t plenty spirited and confident little dogs. They tend to be exceedingly friendly, and when properly socialized usually get along just fine with other house pets and with children. Miniature Schnauzers are excellent choices for watchdogs, as they’re alert, observant, and quick to bark. They may be leery of unfamiliar people, but are quick to warm to anyone their family accepts. The Miniature Schnauzer comes from the countryside, and will still flourish in a rural setting with lots of room to roam. That said, the breed is also ideal for city and apartment living as long as its exercise needs are properly met. The Miniature Schnauzer is a hypoallergenic breed that sheds only minimally, but it does have semi-demanding grooming needs. Show dogs naturally receive the most meticulous and time-consuming care, with regular stripping to remove loose hair. For a pet Mini, clipping/trimming every month or two should maintain the coat in good condition; trim your dog’s nails and give it a bath each month or so, and check its ears for blockages on a weekly basis. The Miniature Schnauzer’s typical lifespan is about 12 to 15 years. This is a fairly healthy breed, but there are some conditions you want to watch out for. They include pancreatitis (inflammation of the pancreas), hyperlipidemia (excess lipids in the blood), and portosystemic or liver shunts, a disorder of the liver’s blood circulation. Other potential issues include cataracts and urinary stones. Miniature Schnauzers require a moderate amount of exercise: They’re active dogs whose blood harkens back to days patrolling barnyards and fields for rodents, after all, and too much sedentary time leads to boredom and very likely some mischief. Daily walks and vigorous play will keep your Mini in good spirits and good condition. Make sure you keep a Miniature Schnauzer on a leash when strolling the neighborhood, as it’s liable to go after any squirrel or rabbit that makes an appearance, and only let it run free in a fenced yard or park. The Miniature Schnauzer is a keen dog whose all-around smarts and eager-to-please attitude make it, generally, a joy to train. You do, however, want to make sure you’re mixing up the exercises and posing plenty of challenge, as the Mini can lose interest in too much repetition in the “classroom.” Early socialization and puppy-training are musts.